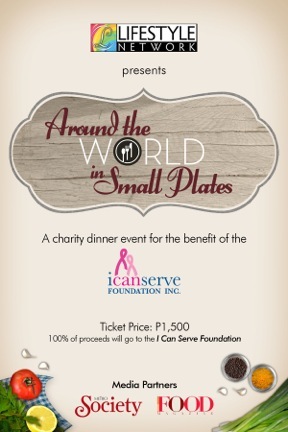 SAVE the date (November 9, 6 p.m. to 10 p.m.) for Lifestyle Network’s AROUND THE WORLD IN SMALL PLATES, a unique charity tasting event for the benefit of the ICanServe Foundation. “Around the World in Small Plates” takes guests on a tour around the world through off-the-menu specials served in small plates. With the collaboration of the country’s top chefs and Lifestyle Network’s very own, the channel intends to create a mouthwatering menu showcasing the different cuisines of the world while highlighting of course our very own. During the event, a mini-fair showcasing international and local products will be available for guests to take home. The dinner event will be held at the Rockwell Tent on November 9, 2012 at 6:00 pm to 10:00 pm. Different restaurants and hotels as well as international and homegrown chefs will join this unique event. As the food authority on Cable TV, Lifestyle Network is giving its viewers a taste of what they see on-air through a unique dining experience. Food on Lifestyle Network is the strongest and highest rating block of the channel. It carries the best of foreign food programs and the most respected food and culinary icons across the globe. It has also successfully produced its first local food program, “Curiosity Got the Chef with Chef Sharwin Tee” (now on its second season), with more unique culinary programs lined-up in the coming months. “Around the World in Small Plates” ensures an explosion of culinary delight that not only excites the tastebuds but also invigorates the soul, all for a good cause. For more information, visit the channel’s Facebook page. ICanServe Foundation thanks Lifestyle Network and its media partners, Metro Society and Food Magazine, for joining the cause of early detection to save lives.